Home Chronic Wasting Disease Idaho CWD Regs- And How They Effect You! Chronic Wasting Disease, also known as CWD, has taken its toll around the US and Canada. This strange TSE (Transmissible Spongiform Encephalopathy) was found in 1967 in northern Colorado and was classified as a “wasting” syndrome. Since its discovery CWD has spread to at least 23 states and two Canadian provinces. CWD is best described as chronic weight loss until death – not a pretty picture at all, and one that has caused grave concern for sportsmen and biologists around the country. Without digging too deep into the details, this short description of what we are dealing with is the very reason Idaho Fish & Game (IDFG) has developed new rules to help prevent this disease from entering their state. 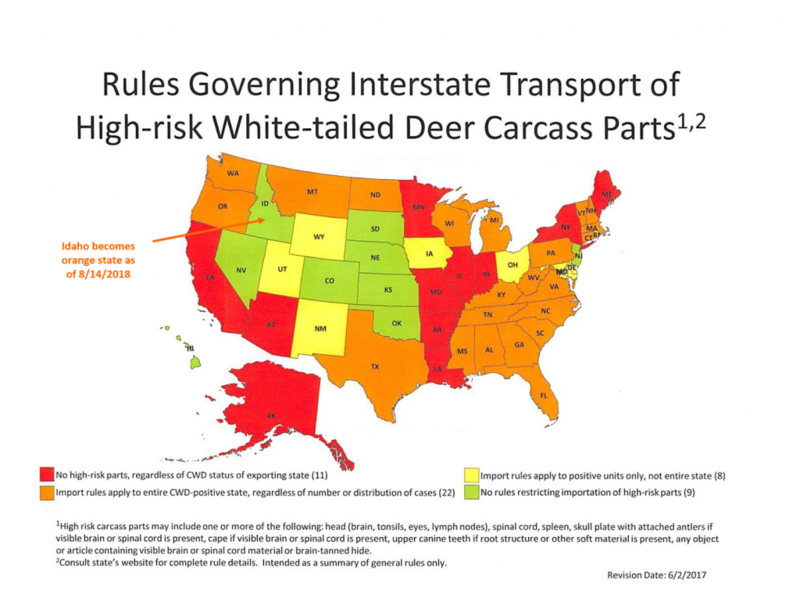 Please review these closely, as they directly effect all successful hunters transporting game from ANY state or province known to have CWD (see map for reference of known cases). The new rule bans the import of any carcass or part of wild deer, elk or moose from another state, province or country with ANY documented case of CWD. This rule was placed into effect immediately and is now being enforced. The first question that comes up is how do we define this? If I shoot an elk in Montana or Colorado can I bring the meat home to eat it? The simple answer is YES. However, there are some hoops to jump through. The disease is known to affect the central nervous system, therefore any of the brain or spinal system cannot be transported. In short, it is OK to transport meat that is cut and wrapped or deboned meat that does not included brain or spinal tissue. Heart and liver are okay, hides without skull are okay, cleaned or dried skulls are okay, etc. So not all bad, but definitely something that needs to be considered. It is no small task to debone an elk and boil the skull prior to leaving camp, and if you are not prepared for it at all then the task becomes much more difficult. Additionally, IDFG banned the use of natural deer, elk and moose urine for hunting big game. This is a game-changer for many hunters and needs to be shared abroad. Some of this may seem extreme at a glance, but the states that have been hit hard with this disease have horror stories to share. One thing we can all agree on as sportsmen and sportswomen: we want to see and propagate healthy herds throughout the country. Our hunting future depends on it and the responsibility lies with us to help mitigate and hopefully end this outbreak. 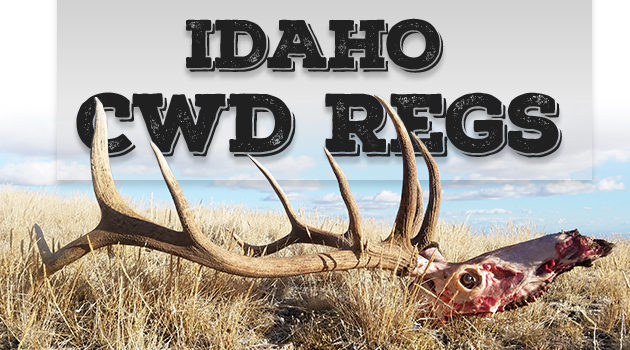 The post Idaho CWD Regs- And How They Effect You! appeared first on Eastmans’ Official Blog | Mule Deer, Antelope, Elk Hunting and Bowhunting Magazine | Eastmans’ Hunting Journals.